Nouvelle Carte du Piemont. / Nieuwe Kaart van Piemont. 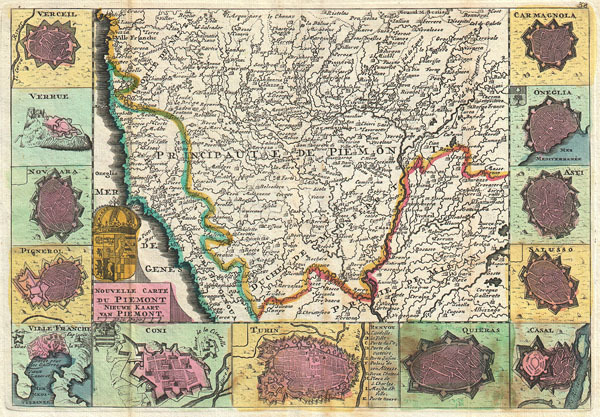 A stunning map of Piedmont, Italy first drawn by Daniel de la Feuille in 1706. This province in northwestern Italy extends north from Milan to the border with Switzerland. Surrounded by thirteen views and plans of important villages and fortresses in this region. From top right in a clockwise fashion these include Carmagnola, Oneglia, Asti, Satusso, Casal, Quieras, Turin, Coni, Ville Franche, Pignerol, Novara, Verrue and Verceil. Title in lower left quadrant in both French and Dutch. Above the title area the armorial crest of Piedmont is depicted. This is Paul de la Feuille's 1747 reissue of his father Daniel's 1706 map. Prepared for issue as plate no. 41 in J. Ratelband's 1747 Geographisch-Toneel.